Live the ultimate lake life with a private dock, stunning views and beds for 18. Lakefront class and comfort meet at Fish Hawk. 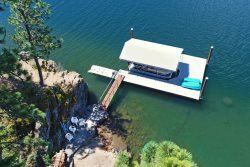 Located in Neachen Bay on Lake Coeur d’Alene, this waterfront dream home will wow you at every turn, while also maintaining a welcoming vibe that makes everyone feel at home. Beautiful woodworking, upscale furnishings and a backdrop of lake and mountain views out nearly every window set the tone for a North Idaho lake vacation the family will never forget. This massive multi-level home left no detail unnoticed. The spacious main living area was made for entertaining. Featuring floor to ceiling windows with lake views, vaulted ceilings and leather furniture, the living room is the perfect spot to gather and make a plan for the day or relax with a movie in the evening. The nearby kitchen is stocked with stainless steel appliances, plenty of space for cooking on the beautiful granite countertops and a wet bar that seats three. There’s room for everyone at the stretching wooden dining table with seating for ten that’s conveniently located adjacent to the grand kitchen. Fantastic for families, this home also offers a second large entertaining area on the lower level. This great space has room for the kids to play and a pool table for the adults, plus a TV and seating. There’s not only plenty of space for fun, but sleeping 18 in beds, there’s plenty of space to rest up, too! The spacious master bedroom has a king bed and a luxurious master bathroom with double sinks, a standing shower, soaking tub and vanity area. Two more bedrooms also have king beds—one with its own attached bathroom with a shower/tub. Next, onto the two bunk rooms. One room sleeps six and the other sleeps three. (See the amenities section for a further breakdown of sleeping arrangements). The outdoor entertaining areas are just as accommodating and impressive! Located off the upper living room and the lower entertainment room, you’ll enjoy two spacious decks—one partially covered and one fully covered. Both areas are filled with tables, umbrellas, seating for everyone and even a hammock! What better way to enjoy a family meal than out on the patio overlooking the lake? When you’re ready to take a dip or set sail, head down to the home’s private dock that’s complete with another umbrella, table and chairs. This is lake life done right!